Wholesale bulk Sunflower starfish, also referred to as the sea stars. Sunflower stars are the fastest moving and largest of the sea stars, they can move up to 4' a minute. Coupled with up to 24 arms, you can easily see where they get their name. 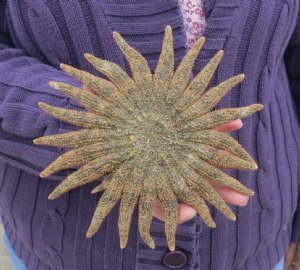 These unusual sunflower starfish are used in making seashell mirrors, shell wreaths, and placed in seashell baskets as an accent to any beach cottage design decor. Since these starfish are more compact with shorter arms, it makes a nice addition to crafts that require a sturdier, less fragile, starfish. We DO NOT sell perfect starfish. Our starfish are all natural and REAL. When a starfish looses an arm, another eventually grows back. You WILL receive some starfish with short arms, chipped arms, tiny cuts, and natural imperfections. The measurements are approximate - NOT exact! These starfish will have a fishy odor. They have been sun dried.